With the end of March comes the end of Women’s History Month, and a very successful WHM it was! SBAI launched our blog on March 1st and we never imagined how much our readership would grow just within this first month. Thank you to everyone who has been checking in with us periodically and letting us know what you think of the SBAI Blog. Now that April is here, we will continue to post regularly – especially since there are so many upcoming LGBTQI Awareness Month events – but not daily. Please stop by every few days to see what’s new! And if you do miss the daily dose of Women’s History, the Noteworthy Moments in Women’s History vignettes we produced along with WXXI are available online here anytime! 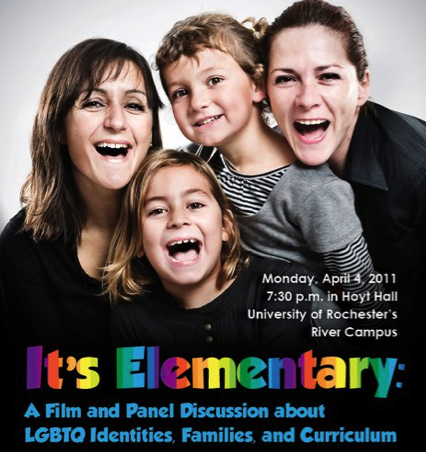 Speaking of LGBTQI (Lesbian, Gay, Bisexual, Transgender, Queer/Questioning, Intersex) Awareness Month, this Monday we are co-sponsoring It’s Elementary: A Film and Panel Discussion about LGBTQ Identities, Families, and Curriculum. It’s Elementary takes cameras into classrooms across the U.S. to look at one of today’s most controversial issues – whether and how gay issues should be discussed in schools. It features elementary and middle schools where (mainly heterosexual) teachers are challenging the prevailing political climate and its attempt to censor any dialogue in schools about gay people. Rather than focusing on the debate between adults, though, the film takes the point of view of the school children, starting as young as first grade. It’s Elementary will screen this Monday, 4/4 at 7:30pm in Hoyt Auditorium on River Campus. The film is captioned and a sign language interpreter will be provided for the discussion. This event is brought to you by the Lesbian, Gay, Bisexual, Transgender, and Allies Special Interest Group at the Warner School of Education and is the first installment of the Out in Reel Film Series SBAI will be co-sponsoring throughout April. Please check the Warner School events listing for more information. This entry was posted in UR Events and tagged #filmseries, #LGBTQIawarenessmonth, #warner. Bookmark the permalink.